Who are these Orthodox– Protestants or Roman Catholics? What do they believe differently from the others? What is the difference between Orthodox and other Christians? Let me try some simple answers to these three questions. 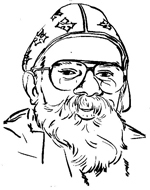 Who are the Indian Orthodox? First, both Roman Catholics and Protestants are Western Christian groups. The Orthodox Church is not Western Christianity. Eastern in origin, it was from the beginning open to influences from all cultures. In the first century, Christianity was primarily an Asian-African religion. Only by the 4th century did the Roman Empire become increasingly Christian. The Strength of Christianity in the early period was in Palestine, Syria, Greece, Asia Minor, Egypt, and Libya. We can make a list of the earliest Churches — the Churches of the first century. Western Greece: 5 Churches — Nicopolis, Corinth, Athens, Thessalonica and Philippi. Eastern Greece (Asia Minor, today Turkey): 15 Churches — Ephesus, Smyrna, Pergamum Thyatira, Sardis, Philadelphia, Laodicea, Troas, Miletus, Colossae, Perga, Pisidian Antioch, Iconium, Lystra, Derbe. As you can see, only 2 out of 37 Apostolic Churches are strictly Western. If Western Greece and Cyprus are also regarded as Europe, then nine Churches are in Europe, while 28 are in Asia and Africa. The Orthodox Church claims to be the true successor of all these Apostolic Churches, including the Italian Churches, which used Greek as their language of worship in that century. So the Orthodox Church is neither Roman Catholic nor Protestant. It regards itself as the true and faithful successor of the ancient Apostolic Church, and regards the Western or Roman Catholic Church as a group that broke off and went astray from the true tradition of the Christian Church. The Protestant Churches broke off much later (in the 16th century and after) from the Roman Catholic. The Orthodox are today in two families — the Oriental Orthodox family, to which the Indian Orthodox Church belongs, and the Byzantine Orthodox family, which is four times as large. The Oriental Orthodox family has five Churches — India, Armenia, Syria, Egypt and Ethiopia – three in Asia and two in Africa. Total membership is over 25 millions. The Byzantine Orthodox family has over 100 million members — in Greece, Russia, Romania, Bulgaria, Yugoslavia, Western Europe, America, Australia and so on. Their members are mostly Slavic, Greek or Roman in origin. But they are also regarded as Eastern, though they are a bit less Asian-African. 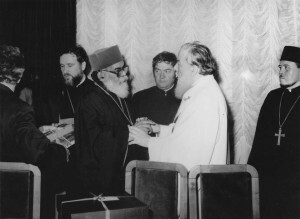 Thus the Indian Orthodox Church is a strictly Asian-African Church, an Apostolic Church in continuity with the ancient West Asian Apostolic Church. This Church was established in India in the very first century by the Apostle. St. Thomas, one of the twelve Apostles of Jesus Christ. It is one of the 40 or so ancient Apostolic Churches of the world. What do they believe differently? The very question is a Western one. In the West a Church is defined mainly by what it believes, ie. by its doctrines and teachings. This intellectualist orientation of faith does not belong to the Eastern tradition. The Orthodox confess the same faith as the ancient Church — the faith as was later formulated in the fourth century in the councils of Nicea and Constantinople. We object to certain later additions made by the Roman Catholics, for example the addition of the word ‘filioque’ in the Latin creed. They, for example, teach that the Holy Spirit, one of the Three Persons of the Trinity, proceeds from the Father and the Son (filioque means ‘and from the Son’). We do not teach so. The son is begotten by the father; the Spirit proceeds from the Father. The words “begotten’ and ‘proceeding’ delineate the difference between the Son and the Spirit in their relation to the Father. In later centuries, especially after the fifth century when the Western Church broke from the Asian-African moorings, it misunderstood the word ‘proceeding’ as related to the coming of the Spirit in the Church on Pentecost. This coming, of course, is from the Father and the Son, but that is not what is meant by ‘proceeding’. The latter word denotes the eternal relation between the Father and the Spirit, and not the relation in time and history. In the eternal dimension we cannot say that the Spirit proceeds from the Father and the Son. Therefore ‘filioque’ is out of place, wrong and misleading. There are other doctrines and dogmas which the Roman Catholic Church has added to the Niceno-Constantinopolitan Creed — eg. the dogma of the Immaculate Conception, the dogma of Papal Infallibility, and the dogma of the bodily assumption of the Blessed Virgin Mary. The first two are wrong and the third is not dogma, for the Orthodox. We do not believe that there is any special miracle called Immaculate Conception connected with the origin and birth of the Blessed Virgin Mary. Nor do we believe that the Pope or any other human being is infallible. As for the teaching about the bodily assumption of Mary, We do teach it, but not as some central dogma of the Church. Nor do we believe that believing in the right dogma is the evidence of a true Christian. We put equal emphasis on the way of life, on the way of worship, on the way of disciplining oneself as on the way of thinking and belief. What then is the difference between East and West? It is not so easy to pinpoint the difference in words. It seems the difference is more one of ethos, of orientation, of spirit rather than of dogma or belief. Let us state some of the more obvious differences. The Roman Catholic Church, for example, believes in a universal organizational structure for the Church with one particular bishop, namely the Bishop of Rome or the Pope, holding a unique position in the whole world. We Easterners do not accept any one bishop as having universal jurisdiction or authority. So the Orthodox have no Pope. What they have is really an Episcopal Synod for each local or national Church. The President of the Synod may be a Patriarch, a Catholicos, and Archbishop or even a Pope as in the case of the Coptic Church of Egypt. But no such Synod or its president can have universal jurisdiction over the Churches of other countries. Each local or national Church with its Episcopal Synod and Patriarch is autocephalous, ie. it has its own head, and does not look to any other Church to exercise authority over it. This difference in turn is based on a more profound understanding of what we call the Church Catholic. The Church Catholic is not the Roman Catholic Church. It is the whole Church, in all time and space, in its qualitative and quantitative fullness. The universal Church is not the Church Catholic. The latter includes all those who have ever lived on earth as Christians in former times, ie. Christ and the Apostles, the prophets, martyrs, confessors, fathers, doctors, ordinary believers and so on. The universal Church is, of course, composed only of those now living. The Orthodox Church had no category called the universal Church. The attempt to create a category called the “ecumenical church” by the Constantinople Church, has been virtually rejected by the Orthodox tradition. This teaching the Eastern Orthodox regard as rank heresy, and based on a fundamental misunderstanding of the relation between the local Church and the Church Catholic. The Easterners believe that the Church Catholic is fully manifest in the local Church, where the people are in communion with the bishops of the Episcopal Synod. We do not regard the local Church as part, but as the manifestation of the fullness, of the Church Catholic. The error in the teaching of the Roman Church, we feel, is due to its breaking away from the tradition of the Church Catholic in the 5th century. Neither does the Orthodox Church teach that the bishop or college of bishops alone exercise authority in the Church. Every baptised Christian shares in the kingly, priestly and prophetic authority of the Church, though the bishop has a certain fullness of spiritual power which others in the Church do not have. But the bishop separated form the Church is nothing. It is only in communion with the Church. With the college of presbyters and deacons and with the people that he exercises his power. The Orthodox Church is thus much more conciliar and communitarian in structure. Neither did the Orthodox Church ever develop an aggressive or institutional mission such as Roman Catholics and Protestants have developed. The witness of the Orthodox is a quiet one, based more on worship and a holy life of love and service, than on preaching and proselytism. This lack of aggressiveness is often criticized by Western Christians as a lack of missionary fervour. But we know that the aggressive Western missionary movement is intimately linked with the economic, cultural and colonial expansionism of the West, and we would rather not be associated with such an aggressive and institutionalized mission. The worship of the Church is the centre of the Orthodox ethos, rather than its mission. The mission follows naturally from true worship and feeds into it. It is in the eucharistic worship of the Church that the Orthodox have a foretaste of the Kingdom which is coming. To join with the angels and archangels in the adoration of the one True God and to rejoice in his presence of the Spirit through the Son– this is the heart of the Orthodox ethos. The Orthodox Churches under Muslim or Communist oppression always survived because of this worship orientation. The West separates action from contemplation, thought and prayer. For us it is in and from eucharistic worship that all action, contemplation, thought and prayer derive their significance.